Knaresborough Town's winning start to 2018/19 was brought to an end by Liversedge on Saturday. After three consecutive victories, Paul Stansfield's men were undone by an 89th-penalty, going down 3-2 in a topsy-turvy encounter at Manse Lane. 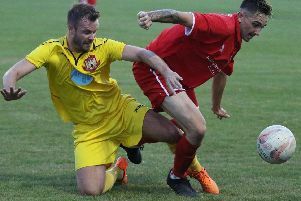 Boro battered their visitors in the opening half and would later rue a number of squandered, taking just a single-goal advantage into the interval. Steve Bromley’s early overhead-kick was kept out by Harrison Davison-Hall in the Liversedge goal, then Brad Walker saw a shot deflected wide. Bromley had a second effort saved, as did Loz Hunter from a free-kick, before Luke Stewart volleyed over and another Hunter set-piece was dealt with by Davison-Hall. A deserved goal did arrive in the 35th minute, however, Rob Worrall’s strike from the edge of the area taking a deflection to wrong-foot the visiting stopper. Boro's Dan Thirkell then deflected a cross from the left into his own side-netting in Liversedge’s first meaningful attack, but play soon switched back to the other end and Sam Cook headed over as the hosts ended the opening period on top. 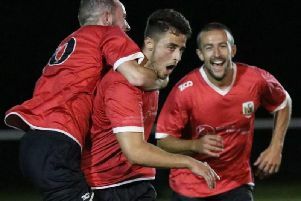 The Cleckheaton outfit came out with a far more positive attitude after the break and Town number one Liam Corbett had to save from Mitch Hamilton before Bromley saw a strike saved following a free-kick. Liversedge continued to press and, following a cross-field move, the ball was not fully cleared by the home defence. A right-wing centre eventually reached Red Bates, who slammed home at the far post to level things up in just past the hour-mark. Corbett then had to save from Joe Walton as the visitors pushed for a second, which, as it turned out, was not long in coming. Striker Walton got it right on this occasion, firing home to turn the game on its head in the 69th minute after being allowed time to pick his spot in the penalty area. Knaresborough attacks were rare at this stage, but with just six minutes of normal time remaining, the Liversedge defence conceded a corner. The resulting set-piece was met by Thirkell at the back post and headed high into the net to restore parity at 2-2. A scramble nearly led to a third for Stansfield's troops as Bromley and Stewart both went close, but the it was to be the away team who nicked a decisive goal. A penalty was awarded following a push at a free-kick and Samuel Ackroyd converted from 12 yards to rob Boro of the point which their first-half performance certainly warranted.